Downs is nestled in colorful Solomon Valley in the north central part of Kansas where two forks of the river meander eastward into Lake Waconda and Glen Elder State Park six miles away. This area is best known today for outstanding fishing and hunting the year round. The Downs community of 1200 is busy and growing and is supported by a wide variety of businesses including industrial, agricultural, retail, and service. Our downtown features an \"outdoor mall-like\" atmosphere, with a variety of businesses, all within walking distance, covering all needs such as art, antiques, automotive, fashion, furniture, electronic, pharmaceutical, medical and dental clinics, hardware, handcrafted items, sporting/hunting/fishing goods, and gifts. Primary exports include wheat, beef cattle, corn grain sorghums, sunflowers, alfalfa hay, soybeans, and pork from locally grown and processed swine at Pork Packers International. In 1879, the Central branch of the Union Pacific Railroad designated a site on the Homesteads of John Beal, Harriet Delay, and Ozariah and Marinda Blunt as their new division point. 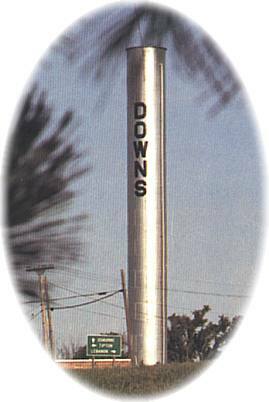 The town of Downs was named for railroad superintendent, Major William F. Downs. Morgan Avenue, the town\'s main north-south thoroughfare, was named after Maj. Down\'s mother. Beale, Blunt, and Delay streets honor the original landowners. The railroad laid out the town at the \"Y\" junction where the tracks split, with one branch going southwest toward Osborne, where it follows the South Fork of the Solomon River west to Stockton, and the other northwest following the North Fork of the Solomon to Lenora. Downs sprang up from the prairie almost overnight. In its boom, the railroad had eighteen scheduled trains running daily. With both passengers and freight, the trains were constantly on the move. Downs also had a large roundhouse with a capacity for ten locomotives, and with its well balanced turntable, could turn the heaviest locomotive with ease. Downs still has its railroad, operated by Kyle Railroad of Phillipsburg, which runs several freight trains weekly. The Downs Unplugged Coffeehouse presents amateur and professional artists the second Saturday of each month starting at 7:30 p.m. until 9:30 p.m.. Enjoy comedy, music, and theater! "Unplugged"
The historic Baptist Church of 1890 is now home to Richardson's Organ Factory. Tour the factory and learn about organ design from a European-trained organ master. The Downs Golf Course is open to the public and located only four miles north of the city. It is a challenging, well kept, nine-hole sand green course. The Lipton Hotel was built in 1880 and is still standing. It once sheltered dignitaries and politicians. Today it houses one of the areas finest gift stores on the street level and some of the old rooms upstairs have been converted into modern apartments.